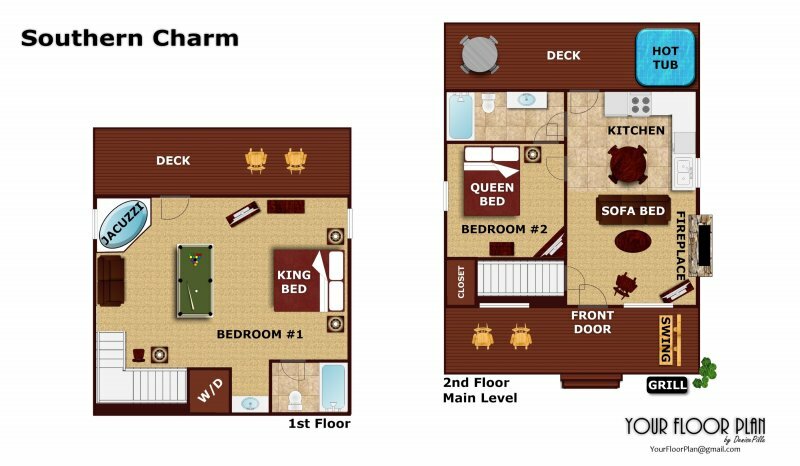 Your guests will be "charmed" when they visit this lovely,two bedroom real log cabin aptly named SOUTHERN CHARM! Located less than one mile from Pigeon Forge in the Arrowhead Resort with community swimming pool, SOUTHERN CHARM is easily accessible with no mountain roads and convenient to all the shopping, dining, and attractions of Pigeon Forge. The home is comfortably appointed for six guests with two bedrooms on separate levels and two separate bathrooms. On the main level a vaulted living room with stone / gas fireplace and a fully equipped kitchen provide a comfortable place to snuggle up with your favorite snack and watch a movie on the LCD TV. Downstairs a HUGE open King master bedroom includes both an in-room jacuzzi tub and a pool table for some game time. Outside covered porches with hot tub, rockers, and a dinnette provide room for entertaining. Call today, relax, and enjoy a little SOUTHERN CHARM! We were very pleased with our stay in your cabin; we are also staying with you in November in "Let the Good Times Roll" Thanks! As always, we had a great experience with American Patriot Getaways! A big thank you to Carol Whitford for helping me select this cabin Her feedback was excellent. It was wonderful, we thourghly enjoyed our stay! Great experience at the Southern Charm. Everything the reviews I read said it was. Our second time with American Patriot Getaways. Very Dependable for a great stay.. Especially loved that it was inviting and cozy with comfy beds. Loved being close to everything. Our choice was perfect. Our family had the most wonderful time at this cabin! Best vacation ever! Thank you American patriot getaway and Southern Charm cabin owners! We were highly satisfied with our stay! The cabin was the perfect size for our family and had everything we needed! Plan on returning and will certainly use your service, only next time, we will stay longer. We will recommend you to our friends and family!! We really enjoyed our stay and are planing to bring the younger children back this this summer toDollywood. We stayed at Bears Tale last year but I couldn't find it in your inventory. This cabin was equally nice. The cabin was beautiful and peaceful. This was my first visit with American Patriot Getaways. I will most defiantely be staying with American Patriot Getaways again. The check in was awesome no messing with additional paper work after completing online. Cabin was advertised as is, easy access, clean and quiet.